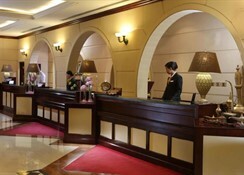 Carlton Palace Hotel Dubai offers luxurious 5-star accommodation at Deira, very close to the Dubai Creek. Melding beautifully Arabian, European and Far Eastern influences in its architecture, and located in close proximity of the Dubai Metro and the World Trade Centre, this a perfect choice if you’re looking to sample the city’s great Oriental culture and heritage and its modern emergence as one of the world’s financial and trade powerhouses. As many as 212 spacious air-conditioned rooms in modern décor, furnished with contemporary furniture, LCD TVs, refrigerators and all modern amenities await the guests. Catering both to business and leisure travellers, within walking distance of great museums, mosques and monuments and also lot of commercial and business centres, shopping arcades and art galleries, this property is well-poised to offer you warm hospitality with a Middle Eastern touch. 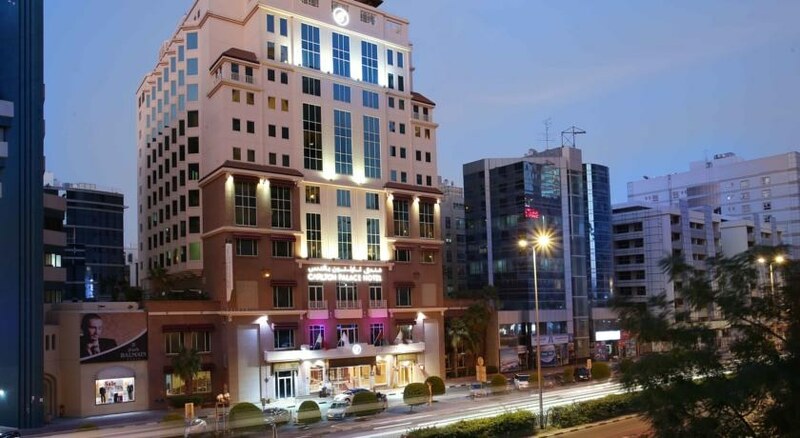 Carlton Palace Hotel Dubai is located on the posh Al Maktoum Street, with good connectivity to Dubai Metro and other public transport. 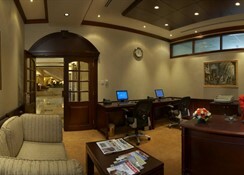 The hotel is just 10 minutes’ drive from Dubai International Airport. Dubai Metro’s Union & Al Rigga Metro Station is an 8-minute walk. The hotel offers a complimentary shuttle to nearby shopping centres, other properties facilities and the beach resort at a small charge. All of the spacious 212 rooms in the hotel have a modern décor and plush furnishing. The air-conditioned rooms come with en-suite bathrooms, flat-screen LCD TV, work station, refrigerator, high speed internet, fax machines, mini bar, cable, laundry and dry cleaning services. The rooms come in categories such as deluxe rooms, executive club rooms, junior suites, executive suites, palace suites, Jumeirah suites and Haroon Al Rashid suites. 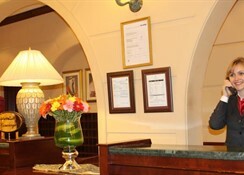 The hotel houses some well-known restaurants catering to a variety of palates. While Al Riqa Restaurant on the Mezzanine Floor offers a round-the-clock international menu in buffet and a la carte style. Dublin Arms is a popular Irish pub in Dubai with a large band of regulars. The Don Corleone – Italian restaurant on the Mezzanine Floor is the venue to relish tasty pizzas and pastas. The Royalton Lounge on the ground floor offers beverages and light bites in a relaxed setting. You can relax on Carlton Palace Hotel Dubai’s rooftop swimming pool surrounded by a sun deck, well-equipped gym, a lovely spa offering Aroma Therapy, Swedish Massage, Balinese Massage, Deep Tissue Massage, Body Scrubs, Thai Massage and Facial treatments. There is a steam room, sauna and Jacuzzi where guests can soak to their heart’s content. There is a shopping arcade where guests can indulge in shopping therapy, a salon and a nightclub to let your hair down.